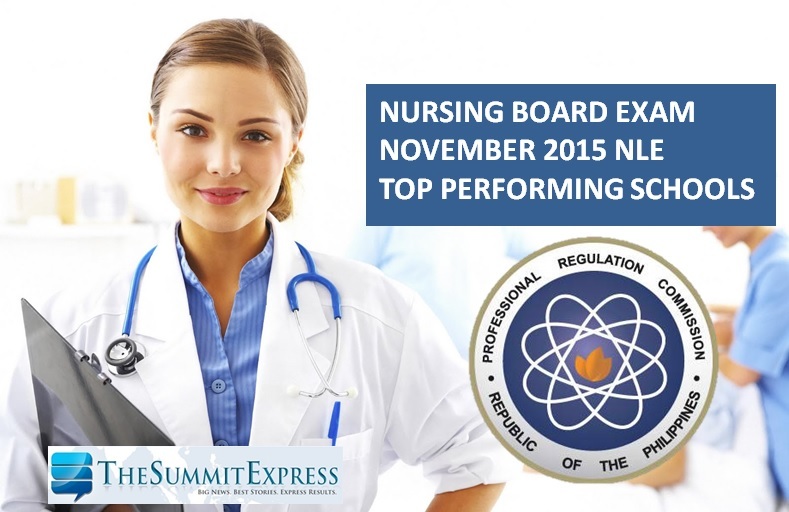 The Professional Regulation Commission (PRC) announces that 9,114 out of 18,500 (49.26%) passed the Nurse Licensure Examination (NLE) given by the Board of Nursing in the cities of Manila, Baguio City, Laoag, Angeles, Cabanatuan, Cebu, Dagupan, Davao, Iloilo, Legazpi, Lucena, Pagadian, Tacloban, Tuguegarao, Zamboanga, Cagayan de Oro (CDO) and Bacolod last November 29 and 30, 2015. PRC named University of Santo Tomas (UST), Mariano Marcos State University (MMSU) - Batac and Xavier University (XU) as the top performing schools in the November 2015 NLE or nursing board exam as per Commission Resolution No. 2010-547 series of 2010: WITH 50 OR MORE EXAMINEES AND WITH AT LEAST 80% PASSING PERCENTAGE.